Hi Leafo. I decided to make LAC "Linux Only" because Windows users already have access to many fine flight simulators, dating back to the "classic" period around and even before the turn of the century, and I wanted to give LINUX users the same kind of experience. I also didn't want to "compete" with any of the Windows-based flight sims because that community has also been very good to me, but some of those communities are struggling right now, and I don't want to take away their devoted users. 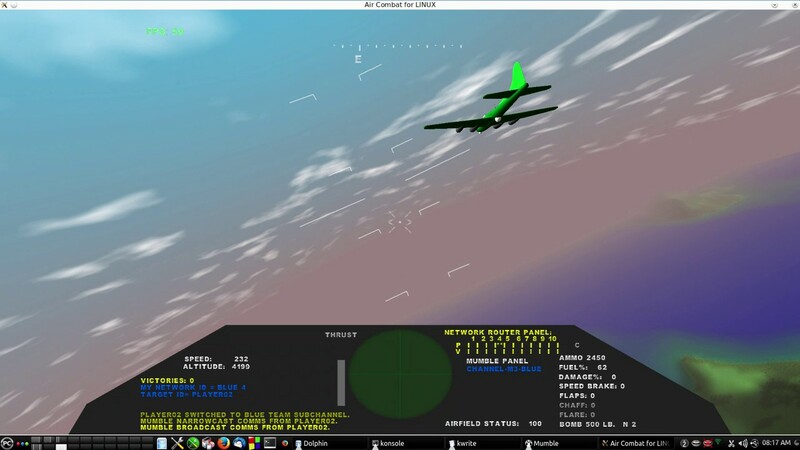 Linux Air Combat community · Posted in Welcome to Linux Air Combat! Thank you mrpete! I'm glad to get your report and hope to meet you in the online missions soon! Would your audience be interested in something as sophisticated as this combat flight simulator for LINUX? I ask this because I realize that the audience for LINUX is smaller than other platforms, and the audience for a sophisticated flight sim is smaller than an arcade-style game. Nevertheless, I am hopeful that you might review it. Thanks! I hope you enjoy this. It's published with full, very CLEAN source code that easily compiles, with no need for modifications or tweaking, on all major LINUX desktop distributions. The itch.io download also includes a precompiled binary that is compatible with recent 64-bit versions of Ubuntu LINUX and PcLinuxOs. Linux Air Combat community · Created a new topic Welcome to Linux Air Combat! I hope you enjoy this free, open-source, combat flight simulator for LINUX. Derived from the classic "gl-117" after an extensive re-write, LAC has been a labor of love for me. I'm new to itch.io but it seems like a great way to support a new "LAC Forum", so this is my attempt to establish one. I will try to be diligent and energetic about answering queries here!